← … And We’re Off to Bocas del Toro, Panama! When Becky sent me the following information about her honeymoon, my jaw hit the floor. She and Bryce took a KILLER trip to South Africa and Mozambique, and now all I can think about is when I can plan a similar trip myself. Since Becky sent me so much great information and a bunch of photos, I decided to split it up into two Real Honeymoon blog posts. Enjoy the first half now, and come back tomorrow to check out the second part. When and where did you go on your honeymoon? We left for our honeymoon the night after the wedding, September 30, 2013. We had some long flights ahead but our final destination was worth it! We spent our honeymoon in South Africa and Mozambique. Our adventure started in Cape Town, South Africa and we were there for 3 days. Then we flew to the Sabi Sands Reserve where we went on a 4 day safari. 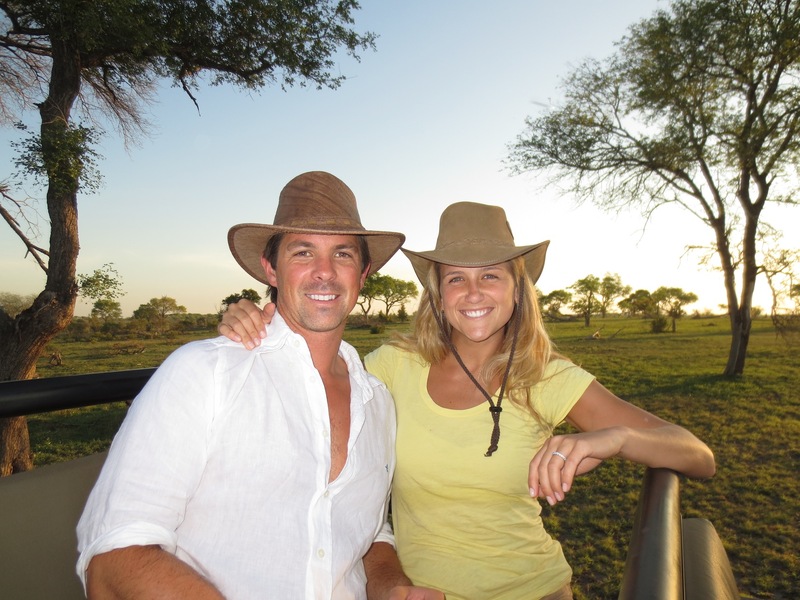 From there we flew to Vilanculos, Mozambique and took a boat to Benguerra Island for the finale of our honeymoon. Here we had 5 days of relaxing on the white sand beaches of the most incredible island we have ever been on! Becky and Bryce in Cape Town, S.A.
All in all, we were gone for 2 weeks. Africa was always our number one. We threw around several other ideas but we always came back to Africa. We both are well traveled and we wanted to go somewhere neither of us had ever been so we could experience it for the first time together. We also wanted adventure, culture, and beach! At the end of the day we new Africa was it – so we decided on South Africa for the culture and adventure, and Mozambique for the beach (but there was definitely culture and adventure there as well)! We had the most amazing dinner and experience at Gold Restaurant. We started the evening with learning to play the African drums. 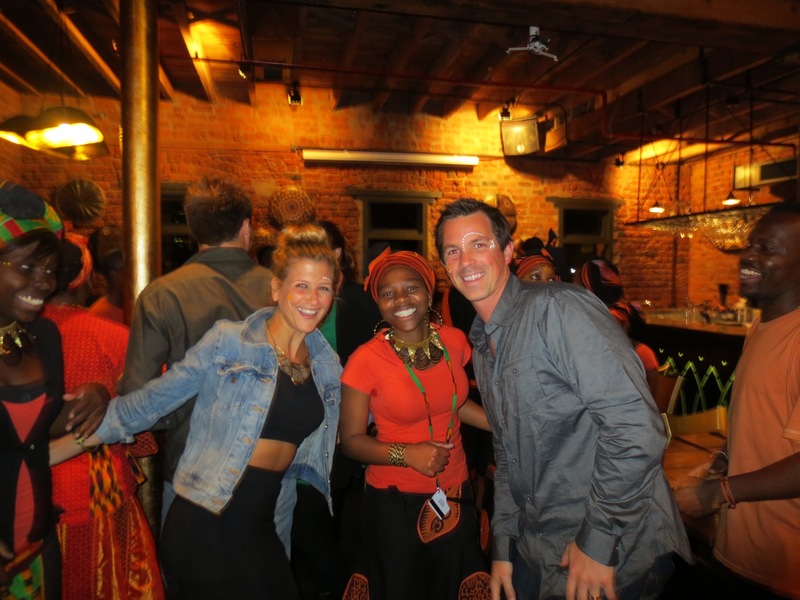 We then had like a 15 course dinner – all African cuisine. Throughout dinner the staff performed singing and dancing throughout the restaurant, it was truly amazing. I even got pulled up to dance with them, had gold flakes sprinkled over us and they also painted our faces. At the end of dinner they pulled everyone up to dance together. Sooooooooooo fun and so delicious! We have so many amazing moments from the safari but our top two was when we saw a pride of lions and a pack of elephants. 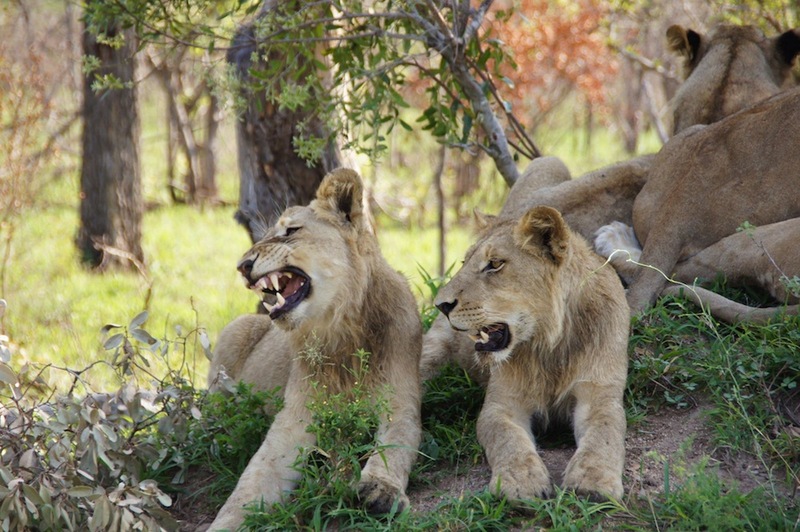 During our morning game drive we came up on about 2 female lions in the bush. As we got closer, there was an entire pride of lions walking towards a little hill area to try and find shade. There were about 15 female and young male lions all gathered together – they looked like they were waiting for something. A few minutes later we saw the male lion (the leader of the pride) slowly walking in. As he approached every lion got up and greeted him with a gentle embrace then went back and sat down. We were so close to all of them we felt like we could reach out and touch them. Once they decided it was too hot – they all got up one by one and left! Another amazing moment was when we were having lunch one day at the lodge. 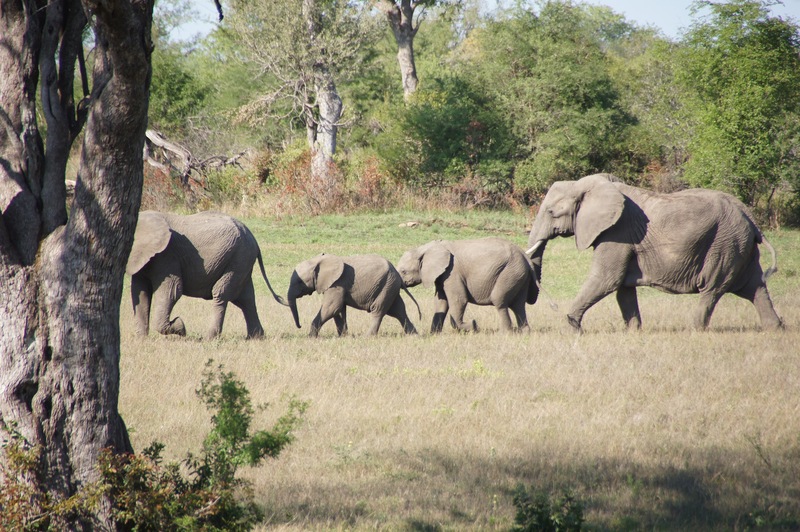 My husband looked out towards the prairie in front of the lodge and a herd of elephants emerged from the bush directly in front of where we were sitting. There were about 15 to 20 elephants of all ages (even a few babies) all drinking water and playing at the watering hole in the middle of the prairie as we were watching in complete awe. It was amazing and yet another remarkable reminder we were witnessing nature. Pretty amazing honeymoon, right? 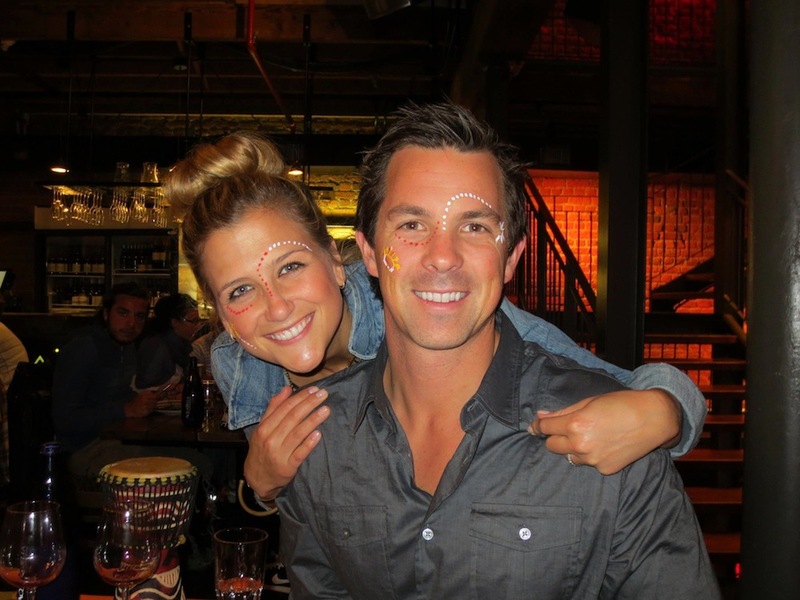 Come back tomorrow for the second half of Becky and Bryce’s incredible honeymoon in South Africa and Mozambique.